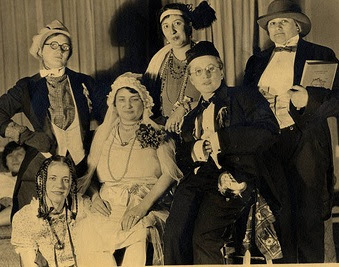 WHY IS THE FANCY DRESS BALL SO IMPORTANT IN PROPER CRIME FICTION? I will start with The Case of the Four Friends by JC Masterman – he was Provost of Worcester (which I always think sounds like a prize-winning dog or horse) and this is a real Oxford Don’s Delight from 1956 – slightly out of era for GA, but very much in the right mode. Is that shape in the corner of the Moroccan bar a Barbary pirate of is it Henry VIII? Is that not an inebriated Charles II trying door after door? And what is that – that dim shadow that seemed to flit down the corridor? Was it only a figment of the imagination or was it Harlequin… searching for the room of Columbine, or Mary Queen of Scots? Yes, if you have ever been the last survivor of a fancy dress ball you will have some conception of the meaning of the word chaos. There’s a party it would be fun to attend. And reading that makes you think there should be more crime stories set at fancy dress parties. Next choice is The Idol House of Astarte, one of Agatha Christie’s Miss Marple stories, first published in 1932. Diana Ashley’s suggestion of a fancy-dress party that evening was received with general favour. The usual laughing and whispering and frenzied secret sewing took place, and when we all made our appearance for dinner there were the usual outcries of merriment… Richard Haydon called himself a Phoenician sailor, and his cousin was a brigand chief…. ‘Why are masks de rigueur, Marguerite?’ he inquired. ‘Your brother doesn’t wear one, I notice,’ remarked the sheikh, nodding to where Fountain, an imposing Cardinal Wolsey, stood talking to Mme de Pompadour. Amberley was watching a girl at the other side of the ballroom. ‘Will you introduce me to the contadina?’ he asked. The first couple of lines of this extract could almost come from one of Ms Heyer’s regency romances, where much is made of dominoes (experienced readers know these are cloaks) and masks…On first reading, Clothes in Books (so snobbish!) vaguely assumed that a contadina was some kind of Italian contessa, but it is revealed later that it means peasant-girl, countrywoman. The fancy-dress party is rather wasted, in this book – the biggest crime regarding the event is gate-crashing, a terrible etiquette howler. As always happens, the invention grew wilder and wilder through the very tameness of the bourgeois conventions from which it had to create. The columbine looked charming in an outstanding skirt that strangely resembled the large lamp-shade in the drawing-room. The clown and pantaloon made themselves white with flour from the cook, and red with rouge from some other domestic, who remained (like all true Christian benefactors) anonymous. The harlequin, already clad in silver paper out of cigar boxes, was, with difficulty, prevented from smashing the old Victorian lustre chandeliers, that he might cover himself with resplendent crystals. - and the amateur theatricals are used to great effect in the commission of a crime. This particular story has a charming and touching ending. Oh, I think this is a great idea for the Tuesday Night Bloggers, Moira! And there's something about a fancy dress ball, isn't there. There's the atmosphere, the costumes (which could hide anyone's real identity), and so on. Christie's The Affair of the Victor Ball, and Colin Dexter's The Secret of Annexe 3 came to my mind when I read your post. Looking forward to your other entries for this theme! Such great opportunities for an imaginative author! Thanks for the reminder of the Christie story, and although I think I have read that Dexter, the plot eludes me, so will have to have a refresher. Thanks. Great post and I'm impressed with the number of examples you can think of for fancy dress balls in crime fiction. I have read that Heyer but I can't remember a ball, then again I can't remember much about any of her mystery novels - except the ending to Penhallow. The only example I can of for a fancy dress all which hasn't been mentioned is the one in Murder Must Advertise, when LPW first appears as the Harlequin. You must enjoy Christie's adventures of Harley Quinn! I do, I have a real soft spot for those stories. I have just been in Italy, and loved seeing the harlequin featuring so much in popular art etc. There's a short story in Hangman's Holiday - the Queen's Square- where Lord Peter is at a fancy dress party, I think at Christmas. Not hugely memorable but a nice bit of science in the solution. Oh thanks, I'll go and look that one out. I remember reading a Christmas-y story in that collection, but I think that's a different one. Oh yes, such a Golden Age trope. There is an E. C. Lorac which features a Fancy Dress Party. It might be These Names Make Clues. That's one of my favourite G. K. Chesterton's stories, too. Thanks, I'll see if I can find that one. I thought there must be one but didn't check! I'll go and look...I am always fascinated by the commedia dell'arte, and the way it developed. This ties into my recent comment in another post about the country house party that Lord Peter Wimsey attends -- it was a fancy dress party! Lord Peter was a (rather well-stuffed) Harlequin, and he was attempting to seduce Dian (pronounced Dee-on) de Momaray who was a link to someone else he was investigating. Gawsh, the weird things that stick in one's memory. Oh yes! And he dives into a fountain doesn't he? While wearing his harlequin outfit. I think it's fair enough that such a strange image would stick in the mind! Isn't that in "Murder Must Advertise?" Yes, spot on Shay, one of my favourite Wimseys. Moira, I'm sure I have seen more films with fancy dress and colourful costumes than read books with this fascinating theme, which explains why I can't think of any literary examples. Your post reminds me that I ought to read at least one story in the G.K. Chesterton's Father Brown series. Oh joy! What a delicious Tuesday Blogger theme. Looking forward to them all. Another famous fancy dress party occurs in Rebecca, which is rarely touted as a mystery (thought it certainly is). The fancy dress disaster occurs courtesy of the machinations of Mrs. Danvers, and succeeds precisely as planned. All taking place just prior to the arrival of all the guests. .... and yes, what a brilliant idea, thanks for the suggestion. It is such a horrible moment for the poor girl. Now I am old and more hardened, but when I first read it I could hardly bear it, it was too easy to imagine oneself in such horror and mortification, I was probably a similar age (and similarly romantic and silly) to the 2nd Mrs de Winter. Moira: Not connected with a book but your post reminded me of a conversation I had while out in Calgary for a family and friends supper on the weekend. One of the women (who does love reading) told me that as a young woman she decided to make a skirt out of men's ties to have a special party dress. She got a variety of ties and took out the stitching and ironed them and sewed them together. It looked great but it was so heavy when she put it on she could not keep it up. She solved that problem by sewing a belt in the top of the skirt. However, it was so heavy that when she twirled the sweep of the ties would send her off-balance in the direction of the twirl! I don't remember that many books with fancy dress balls, but it is probably just my failing memory. There was the party in Barnard's The Skeleton in the Grass.